Good beer but one to avoid. I bought one pint and three halves of Adnams plus one half of Wadworth 6X. Was charged £15.40 which I didn't think of questioning at the time as I had already had to ask for the pint (mine) to be topped up. It's a pub where they just pull it up and put it in front of you before it's settled which is their way of telling you that's what you're getting. Anyway the pint was filled and I paid. Took drinks to table then realised the five drinks I'd bought only measured up to three pints. So, over a fiver a pint. The till screen shows the staff what to press for the order and adds it up itself so there was either a mistake and I was overcharged or it's just too pricey in there. Was served by the older bloke with tattoos. Guvnor perhaps, I don't know and maybe never will as I'll walk past next time. 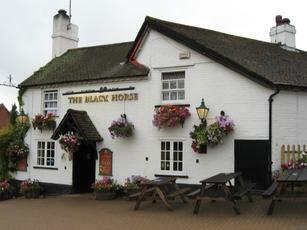 Hi, I would just like to say that I had a great meal in the Black horse tonight. My husband and I both ordered the fresh Billingsgate cod, it was a little more expensive but it was worth it! Maybe the best fish I have tasted in many years. Amazing fish, great chips, good beer, lovely pub, nice people, what more could you ask for? Was once a really good, quiet, country pub where you could enjoy reasonable home cooked food, good conversation and witty banter without excessively noisy music and loud mouths but now it seems to be going downhill fast and the new management don't fill me with confidence. Looks like I'll have switch to a new local and there plenty of good one's to choose from but I prefer The Boot in Sarratt which is consistently good, very friendly with fantastic food in a great setting and the Land of Lib in Chorleywood / Heronsgate for it's excellent real ale. It's a pity really, I'm going to miss the Black Horse but not for long and I won't miss the bar staff or he inconsistent food or the sometimes completely empty evenings or the local drunks! Was once a fine pub, now really loosing its touch, It depends what time you go to the pub to how you will be treated as a customer, evening staff are always very pleasant, helpful, and friendly, nice atmosphere. In the day time, the staff are appalling, bad attitude, rude, normally drunk, enough to put you off ever going back. I stayed and and had one of the best Sunday roast dinners I have had for a long time..
Well what can I say !!!! I asked behind the bar if this was a normal evening and was told that the pub was home to the Chorleywood open mic night and it takes place once a month.. The ales were well kept and believe me you can't knock the food.